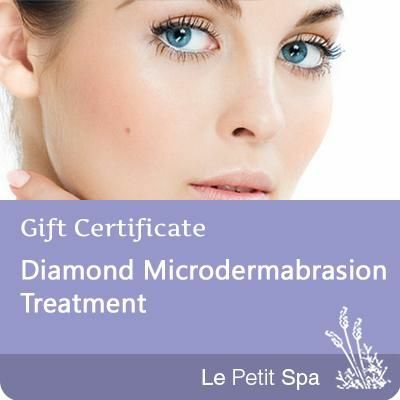 The Diamond Microdermabrasion Treatment may be ideal for those looking for results only, and not focused on receiving the relaxation benefits from a full facial; although, this treatment is done in a relaxing day spa environment. The length of the treatment is 20 minutes. The treatment includes cleanse, microdermabrasion treatment and moisturizer to protect your skin. The microdermabrasion treatment does not include many of the steps found in the Micro Facial: the masque and massage. There is no down-time after having microdermabrasion done. It's completely non-invasive and your skin will be beautiful and glowing. While you will see results with one service, Microdermabrasion is best done in a series of 3 or 6 weekly treatments. Talk to your esthetician about purchasing a series at lower cost than individual services. This gift certificate covers the entire cost of the service, taxes included. Gratuities cannot be added to gift certificates. Please allow up to 2 business days for gift certificates to be processed. All purchases of gift certificates are sent via email to the email address provided. We do not mail out physical gift cards. If you would like to include the name of the recipent on the gift certificate, please include it in the comments box in the ordering process. Le Petit Spa gift cards can be purchased online for in spa use and balances are conveniently tracked online. Le Petit Spa will not be responsible for lost or stolen Gift Cards. The Le Petit Spa Gift Cards are non-refundable and cannot be transferred, exchanged, resold or redeemed for cash. Gift Cards are excluded from all promotional discounts.